A new book with over 440 photographs of musicians in Portsmouth during the 1950's and 1960's. You can get the book at Blackwells, the City Museum shop (Museum Road) and the Southsea Gallery in Albert Road, almost opposite the King's Theatre. The RRP is £14.95 ). 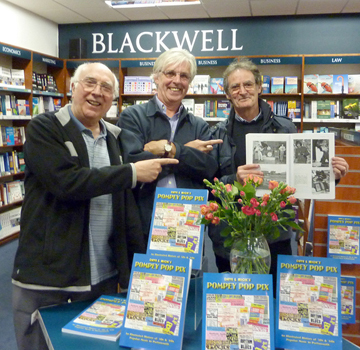 Mick Cooper (Heaven), Dave Allen (Rosemary) and Nigel Grundy at Blackwell's. Few local musicians of note from the 50s and 60s are missing. There are stars too including a Nigel Grundy section from the Pier etc and a few more unseen Rod Stewart in Pompey pix. About 70 pix are posters/tickets, there are folk, jazz, skiffle & dance band sections and well over 200 of pop/beat/rock acts. It’s organised in sections, chronologically with a central colour section and each section has a single page of introductory text.